I have never been more ready was all I could think when the pressure waves became more consistent. I woke up at 5:39 am to what felt like a menstrual cramp. I ate a little started drinking water and couldn’t help but fall back to sleep as my mind prepared itself. I woke again at 9 am to the same feeling. I felt at ease. I began walking the stairs at my house because I knew it was time. For the first time my mind did not race or panic and I hadn’t even begun the self-hypnosis just yet. I felt proud of myself, a feeling so long forgotten. Throughout the morning the pressure waves became consistent and along with letting my midwives know I felt ready to begin the hypnosis. My birthing partner was by my side, the track began to play, my finger dropped, and my Mental Light-Switch was off. It was just me and him and it was quiet and peaceful. When the pressure waves again started I felt as if it was a hug. By midnight I was 5 minutes apart and at that point I was excited. In my mind I pictured my Special Safe Place, which was a forest I had often visited anytime I felt left behind or hurt or unloved. It was my safe haven and to share all this with my little one and birthing partner I had for once brought good feelings to that safe haven. We left our home everything packed and ready and with my mother driving. We drove 40 minutes to my midwives and at that time my body somehow pushed the pressure waves to just 2 minutes apart. On the way there I was sure I knew the right road to get on as soon as we were clear of the freeway thinking I knew my way I turned off the GPS and told my mother turn left. Yet what I meant to say was right. My helpful and unknowing mother of course took the left as to not upset me to make me lose my focus. Within seconds we were back on the freeway. With my birthing waves 2 minutes apart at this point I needed to find peace and quickly as the GPS rerouted. We had to drive for an extra 14 minutes back to the road we should’ve been on before. I will admit I lost focus because I panicked and had it not been for the calmness of my partner and mother I don’t think I would’ve easily regained it. We finally arrived at 1:44 am. My heart was calm and mind at ease with what I knew what was coming. The tub was filled and a few moments later my water broke. My light-switch was off at that moment and all I felt was a slight pop. I smiled at my littles ones progress but at 8 cm I felt something might have been off with her position though she was facing down I felt like she needed to be checked. Sure enough her head was a tad bit off center. 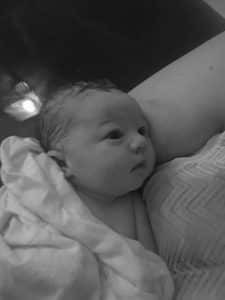 The next few cm would be spent getting her to center and of course the midwives did just that by 10 cm she was centered .Throughout the birth I stayed on my knees and switched from bed to even the floor or back to the tub. 3am to 6am was the most challenging times to keep my breathing focused. I focused on listening to the Easy First Stage track and at 5:50 am I went back into the tub on my knees and felt the need to bare down and push. That’s just what I did. Putting my back up against the tub with my arms supporting my weight I pushed and pushed. My husband ready to help catch our child smiled and said she has hair. I smiled, just like I did was all I could think. I kept my eyes closed and continued to let my body do what it was meant to. By 6 am my baby was in my arms. She cried that beautiful cry and I couldn’t help but hold her to my chest. She was here and all the trials and fighting while pregnant were over. My husband and I looked at our beautiful baby girl and shared a smile and tears. I will never forget this day. Added thanks to my Hypnobabies instructor Claudia Buckley of Birthing Divine for all her wonderful guidance. I couldn’t be more grateful to learn what I learned.